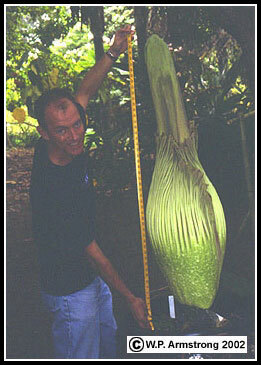 The blossom of Amorphophallus titanum on Thursday July 11, 2001 at Quail Botanical Gardens in southern California. 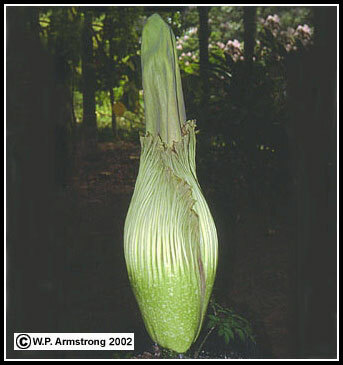 The pleated spathe is still wrapped around the erect spadix. 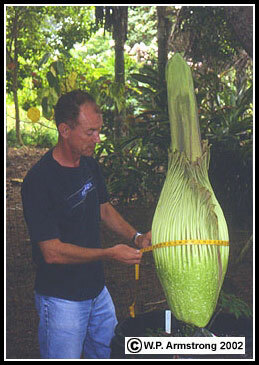 On the following Tuesday July 16, 2002 the spathe opened into a brilliant reddish funnel (see below). The gigantic blossom (inflorescence) of Amorphophallus titanum on display at Quail Botanical Gardens in Encinitas, California. This remarkable botanical curiosity was grown by horticulturist Marco James Booman, owner of Plants For Kids. The blossom of Amorphophallus titanum on Sunday July 14, 2001 at Quail Botanical Gardens in southern California. The pleated spathe is beginning to separate from the erect spadix. 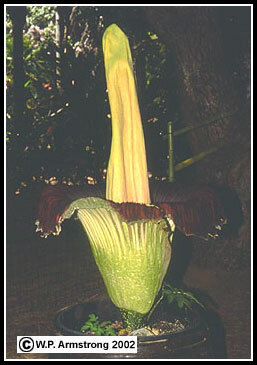 On July 16, 2002 the spathe opened into a brilliant reddish funnel (see below). 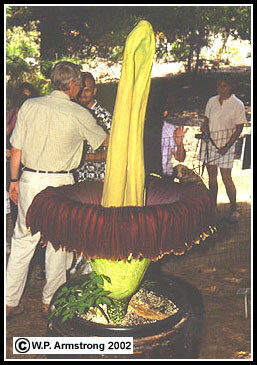 The fully opened blossom (inflorescence) of Amorphophallus titanum on Tuesday July 16, 2002, on display at Quail Botanical Gardens in Encinitas, California. 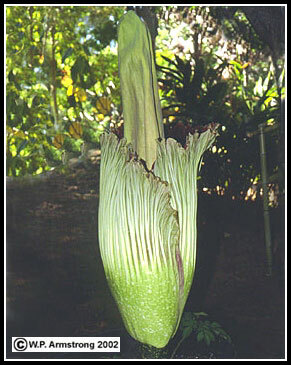 As the spathe opened, the blossom emitted a powerful carrion stench that filled the air of this serene botanical garden. This remarkable botanical curiosity was grown by horticulturist Marco James Booman, owner of Plants For Kids.